I had a couple of free days this week in which to work in my studio. As you see, I have a little TV there to keep me company. That is Kati Marton on the screen (wife of Richard Holbrooke, ex-wife of Peter Jennings) being interviewed by Charlie Rose. Her latest book, Enemies of the People: My Family's Journey to America, on the harrowing lives of her parents in Hungary during the second world war sounds like a good read. 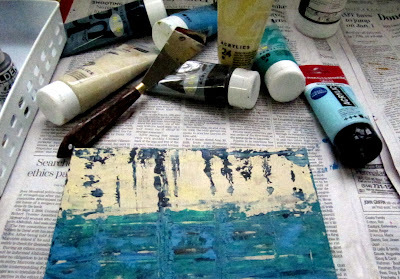 On one of my work tables, you see a few paints gathered for current works in progress. I work with acrylics and usually have quite a mess to clean up after each session. I am self-taught, so I imagine even my work style does not conform to professional standards. But it is my way, and it will have to do. Below is a work in progress on a wood base designed to receive paint. These wood pieces require no framing. Since taking this photograph, the painting has evolved considerably. Looking at it now, I wonder if I should have left it as it was. One of my challenges is knowing when to stop. I have ruined many a good piece, by thinking "oh, I'll just add a little....". 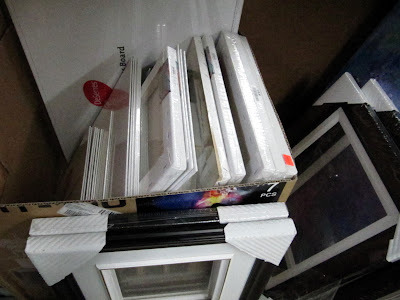 Below are a few empty canvases and frames waiting for my attention. Below are a few more pieces in progress. 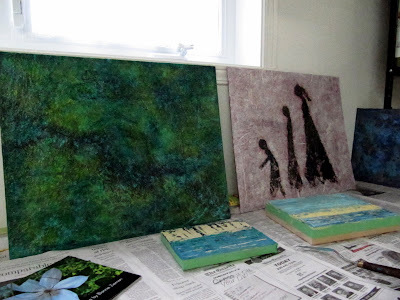 I have them propped up where I can look at them - hoping the muse will tell me what they may still need. The muse speaks in the softest of whispers - and I often miss them. I know, I know - turn off the TV!! Often, I do. Below is another work on wood. It, too, has changed considerably from when I took this shot. I will post the end results for you to see soon. 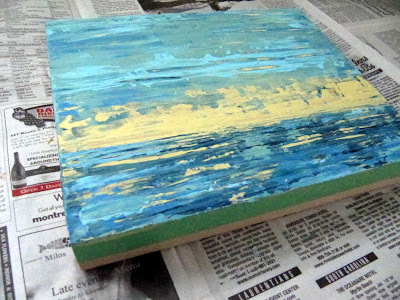 I love to do abstracts and am a fool for textures. I also tend to prefer things that are quite monochromatic, whereas my husband who loves contrast walks by and says, "more colour, more colour!" He is a trained artist, having attended the famous Ecole de Beaux Arts here in Montreal - so I feel a certain inner pressure to listen to his suggestions. However, I think the work usually turns out better when I follow my own impulses. It is wonderful, though, to have him to consult at any time. It is my intention to give some of these paintings as gifts to friends and family. I much prefer to do this than spend my day in a mall looking for just the right manufactured gift. This way, even if the painting is does not enthrall, they know it comes from my heart and was created by my hand. We have a TV in our studio too but we don't watch anything near as lofty. I don't paint but I understand not knowing when to stop. I think you are quite brave to withstand your husband's calls for his idea of improvement. I also think you are quite wise to listen to the whispers of your own muse. Quelque fois les choses les plus simples sont les meilleures, elles ont plus de fluidité et d’intensité. J’ai suivi des cours de peintures au Art Institute of San Francisco et notre professeur aimait beaucoup les peintures abstraites. Il disait qu’il fallait essayer de peindre pour une certaine lumière et profondeur. Vous avez raison d’accorder une oreille distraite à votre mari et de suivre votre instinct. J’aime le tableau vert sur votre poste – des tons un peu mats mais nuancés. Those are beautiful, Bonnie. I love the first one to be framed and the large green painting at the last photo is really nice :) I must look in your etsy shop! What wonderful gifts you are giving to your loved ones! I don't know where you find the time with all of your writing! Do you have a housekeeper? I love the works that are against you wall and also your studio. Thanks for the tour. 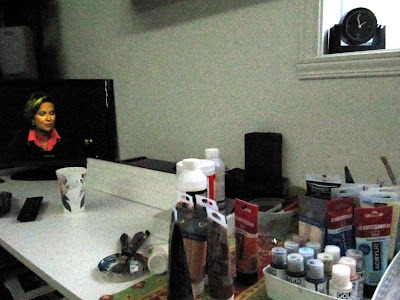 Thanks for the visit to your studio - and a look at your work. Having the artistic talent of a doughnut, I love seeing what others do. Those who can,t do.... drool. Anyone would be appreciative of such a gift. I'm partial to the greens and blues, but love them all Bonnie. Your painting "The Ties That Bind" especially speaks to me! i think these would make wonderful gifts...much better than anything bought...i miss painting...i need to try again soon. love th works in progress and what you say about the muse...so true. Thank you for sharing your studio with us...I painted for awhile because I loved it but I am not trained...i just loved color and texture. perhaps i will go back to it. you have inspired me.